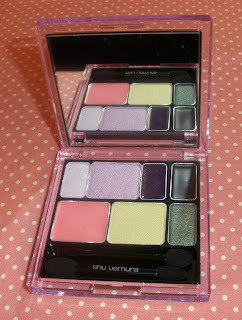 Shu Uemura released 2 gorgeous palettes for fall plus some other goodies that didn´t catch my attention really. 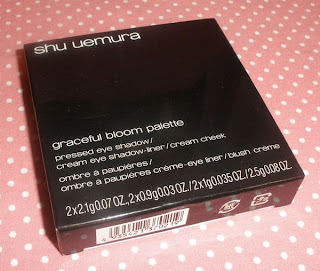 I ordered the Graceful Bloom palette which I scored on eBay for a few bucks below retail (not really saving a lot but still a bit) because it was the one item that really looked attractive to me. The Graceful Bloom palette comes in a sturdy and very pretty chunky square palette along with 2 applicators and a mirror of course. 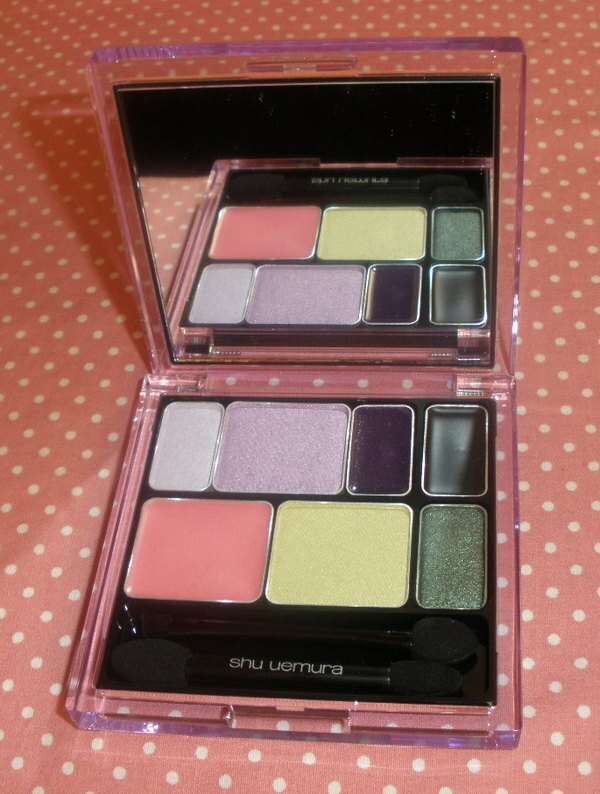 The palette features 4 powder shadows, 2 cream eyeliners and a cream blush. 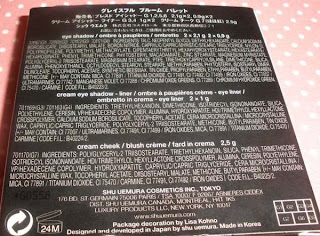 The powders come in duos with a fitting eyeliner for each color combo. Graceful Bloom contains a light and medium purple with a purple eyeliner and a pale lemon green, medium forest green and a black eyeliner. 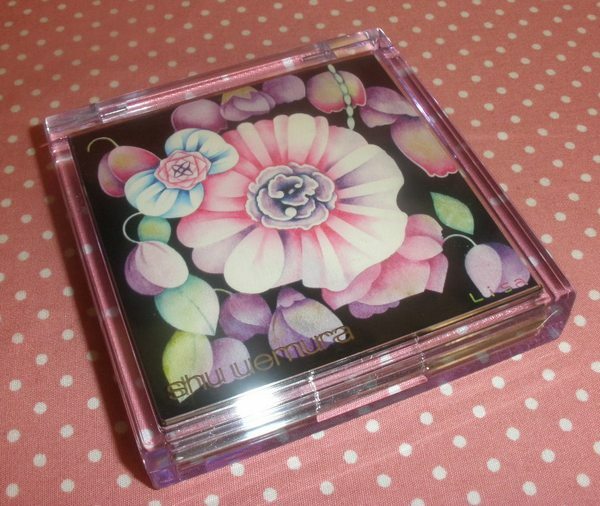 The blush is a silky shimmery pink and blends really easily even on top of powder. As I expected the quality is really top-notch with a silky texture and a pretty pearl shimmer. However the colors themselves are more suitable for spring in my opinion as they are all leaning towards pastel. The gel liners are fine, they last really well and stay put once applied however they are not as smooth as other gel liners so they tug on my delicate lids more than I like. The lasting power is good for all items but I experience a little creasing with the shadows after several hours of wear. 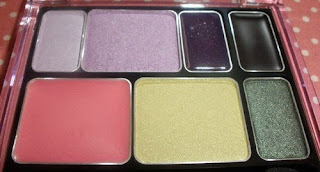 Overall I´d say this is a gorgeous palette but a bit too pricey in my opinion. 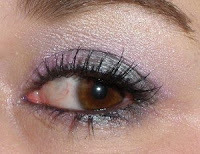 The colors are more suitable for spring and summer and the cream eyeliners are just average. I believe it retails for somewhere around US$65 or so... I paid about 60 or so? ahh it is a little pricey ><...but the colors are gorgeous! I think this is a pretty palette. I love the holiday collection too, so many gorgeous holiday collection, I really dont know where to start! that definitely looks more spring than fall. pretty green shades, though! wow that's a super lovely palette and you've done a great look! What a gorgeous palette! :) The colors are beautiful! I wanted that one its so pretty!!! 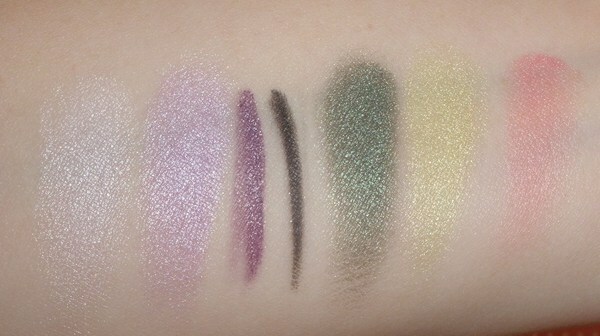 and the swatches are nice! I love the combination of colors. I wear all colors year round, so I'm getting this one. It'll work well with some of my darker shadows too. It's definitely pricey though. 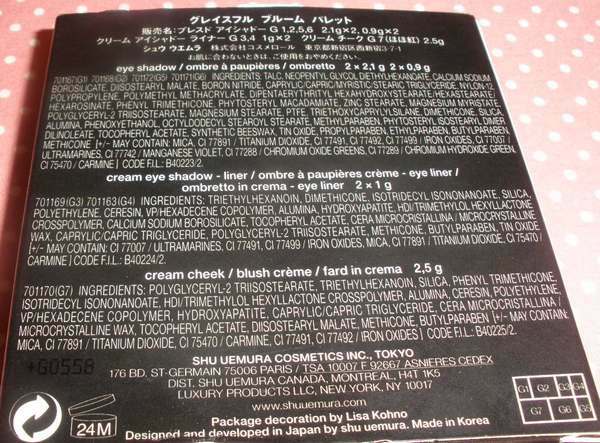 I think some of these cosmetic companies need a reality check. this palette looks really gorgeous on you!